Why is it that most marketing leads fail to help sales generate revenue and retire quota? Marketing leads & appointments that are more a source of frustration than a source of revenue. 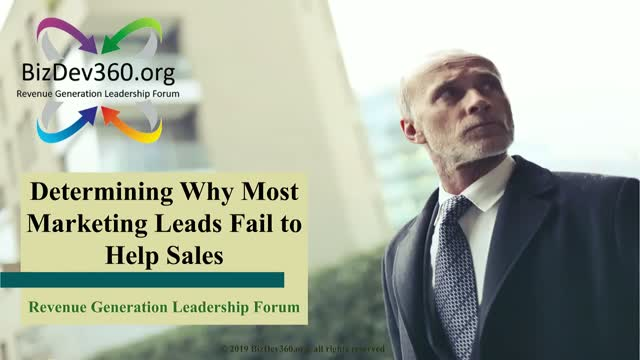 Join industry leaders to weigh into this highly contested area that affects revenue growth in what will likely be a heated exchange of insights focusing on determining why marketing lead’s fail to help sales. Many organizations have shifted considerable focus on driving account-based marketing strategies to augment their traditional marketing activities. Which ABM strategies actually work and drive revenue? Join industry leaders to weigh into this highly contested area that affects revenue growth in what will likely be a heated exchange of insights focusing on determining which account-based marketing (ABM) strategies drive revenue. Marketing serves two customers. The external customer and the internal customer or sales organization. Alignment with the internal customer is just as important to revenue success. Research has shown that revenues are positively impacted when marketing improves their alignment with sales. Join industry leaders to weigh into this highly contested area that affects revenue growth in what will likely be a heated exchange of insights focusing on determining the effects of marketing and sales misalignment. Working with leaders we found that the costs associated with the engagement of marketing generated leads far exceeded the costs associated with producing the lead. While leads remain the lifeline of sales organizations, the cost of engaging underqualified leads would cause most to reconsider what gets communicated to sales. Join industry leaders to weigh into this highly contested area that affects revenue growth in what will likely be a heated exchange of insights focusing on determining the true costs of underqualified leads. Directly attributing revenue from digital marketing efforts has traditionally been a serious challenge for marketing departments. For many the digital content strategy has become a money pit with no clear signs of revenue. Join industry leaders to weigh into this highly contested area that affects revenue growth in what will likely be a heated exchange of insights focusing on determining digital marketing’s real impact on revenue. Visit us at www.BizDev360.org and join the growing community. BizDev360.org is a new revenue-generation leadership forum for senior sales and marketing executives who - by invitation only - participate anonymously and share insights on key areas that effect revenue generation. Unlike other forums, no vendors are invited, nor permitted to contribute. This is a forum by and for top-level industry peers only. Participants like you are invited to help by providing their insights via an upfront questionnaire and then in a subsequent online forum. The results gathered before, during and after each event will be collected, analysed and delivered to each participant in the form of an insightful report.